"Memorizing entire books or passages will keep intact God’s succession of ideas, without interruption. Many individual verses, memorized out of context, can give a false meaning..."
"Memorizing entire books or passages will keep intact God’s succession of ideas, without interruption. 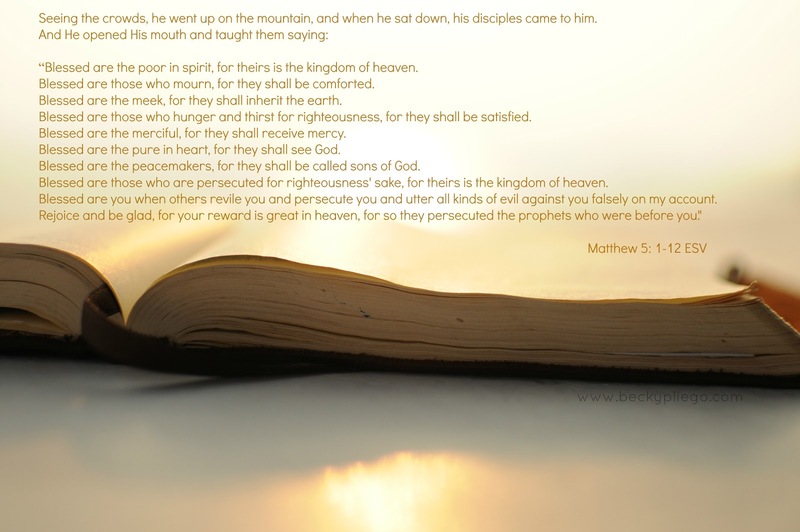 Many individual verses, memorized out of context, can give a false meaning"
"When the Lord Jesus preached His famous sermon, the Sermon on the Mount, He began with the Beatitudes. Too many people read these as though they were a set of impossible hurdles. But Jesus was beginning His message as God loves to begin all His gospel work—with promises. We are told in Scripture that the one who begins a good work in us will also be faithful to fulfill it. But we may also reason backwards—the one who will fulfill the good work is the one who began it. If He gives us the gift of seeing Himself, He also gives the gift of enabling us to be peacemakers. If He gives us the filling, He also gave us the hunger and thirst for righteousness to begin with. *Please feel free to download today's image for your personal use.